When I was a kid, my first gaming console was the Nintendo Entertainment System. My beloved NES kept me entertained for hours with games like Zelda, Metroid and Tetris. Now and then I’ll go back and play these games, as they are just as much fun now as they were when I was a child. The great thing about Tetris is that it’s such a simple game. Just stack the various blocks on top of each other in the attempt to eliminate rows. This game has been recreated on just about ever platform imaginable, which now includes a watch. 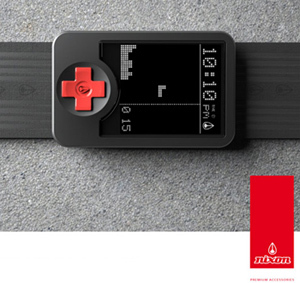 The Tetris & Pong Forever watch features a d-pad which allows you to play either Tetris or Pong. Though I’m pretty sure you could have guessed that from the name. I never had the opportunity to play Pong on an old Atari (that was before my time), but I’ve still enjoyed wasting plenty of my time playing Flash versions of the game. Unfortunately, this is only a concept design, and will likely never make it to the production line. It’s always so sad to see such cool concepts and know that they will never be created. No one plays pong really anymore… but the tetris community has been strong since the beginning, I can go to a tetrinet server right now, even after yrs of not playing, and find 100’s of people playing each other. This watch would sell and make a killing.